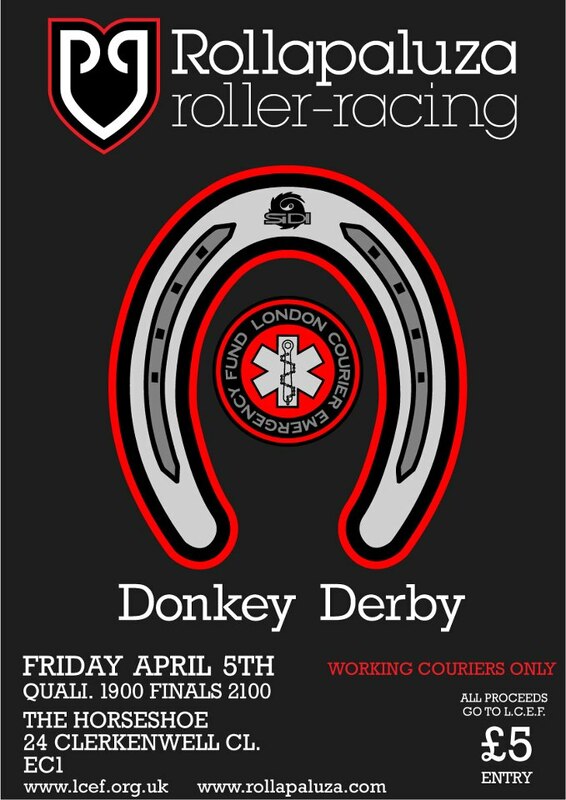 The new edition of the Donkey Derby , roller-racing for working couriers only , is upon us. The 1st LCEF fundraiser of the year will take place at the Horseshoe pub, its original home, where it all started many,many years ago. Back then, Kaspar and friends brought roller-racing to London after being inspired by the Goldsprints in Zurich. High-speed rolling, crazy cheering , copious amounts of boozing and top-notch beats all contributed to make roller-racing nights must-go events in the courier calendar . Roller-racing has happened in many venues but we will always have a soft spot for the Horseshoe. Kaspar and Winston have gone onto bigger and better things in the past 6 years or so by setting up Rollapaluza but once a year, they return to the warm and sweaty bosom of the courier community. So come and cheer on your favorite messengers. Only working messengers are allowed to race but everyone is welcome for a night of rolling mayhem. Winners will go onto the Rollapaluza National Series Finale so come and set your lungs on fire. Beats’n’roll by Dazzler and Adamski.